Description:	Faro table in the Boulder Club Card Room. "The card room at the back of the old Boulder Club where Larry Hazelwood played bridge, Jimmy Young played poker, etc. Permission to take this photo given by Jimmy Young, part owner along with Ken Houssels, Sr., Larry Hazelwood, Connie Hurley, and Mrs. Witcher. At the table left a shill from Horseshoe; right- Blackie- a Boulder Club shill; Standing behind Blackie, Boulder Club Bar manager, Ben; Standing next to Ben two regulars of the Boulder Club." 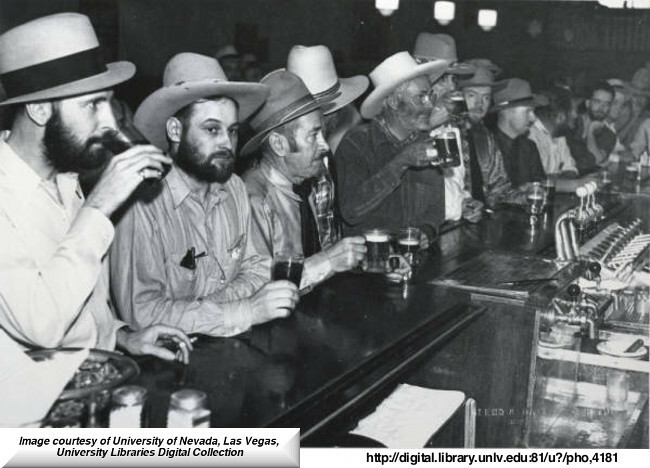 Transcribed from photo sleeve: "About August, 1953"
In the article above dated July 8, 1931 the applicants lost their battle for licensing at the Supreme Court of Nevada. 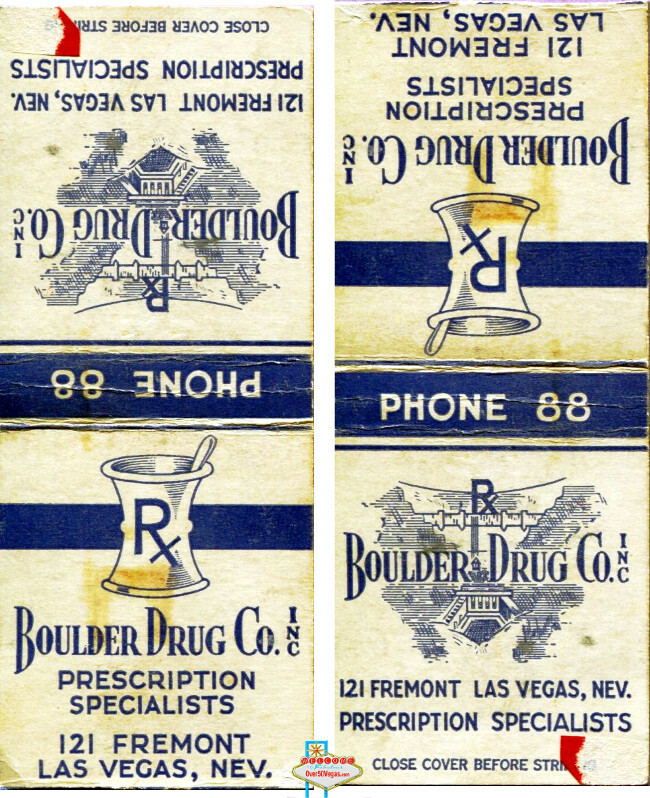 The Boulder Drug Company was located at 121 Fremont St. Like many other small businesses it had slot machines that were installed in the earliest days of legalized gaming. In his book, Roll the Bones, “© 2013 David G. Schwartz” writes that Boulder Drug was licensed by the Las Vegas City Commission for 8 slot machines in 1931 while the Vegas Sweet Shoppe was licensed for 17 machines on June 29, 1931. Traffic jam on Fremont Street right in front of Boulder Drug! ..."In 1940, ‘41, ‘42 the Boulder Club was the biggest club. You had the Sal Sagev and the Apache Hotel. The Nugget wasn’t there yet. When Guy McAfee came to town and had the Frontier Club, he brought Los Angeles officers up with him to be his special officers. When I was a policeman I went over at the Boulder Club, and in addition to my regular shift on the police department, I worked as a special officer in the Boulder Club prior to going into the navy." 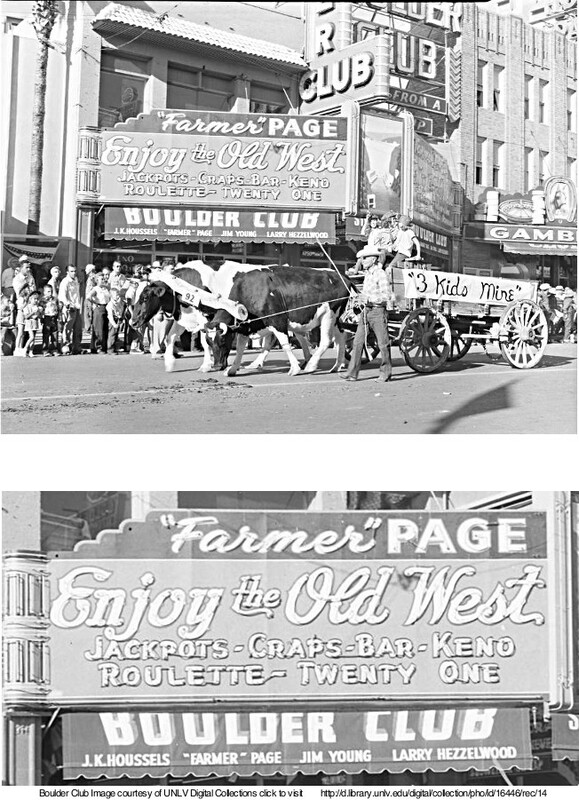 The Boulder Club had a long and colorful run from July 27, 1929 to September 30, 1960 at 118 Fremont St. in Las Vegas. In 1929 Prosper J. Goumond, joined with brothers Jack and Joe Murphy, Walter Watson and Clyde Hatch and bought the lot at 118 Fremont Street in downtown Las Vegas to build a new club. The Mason Valley News, on June 8th, 1929, reported that the Boulder Club would erect a two-story building in Las Vegas. of the two-story Boulder Club building was practically completed. 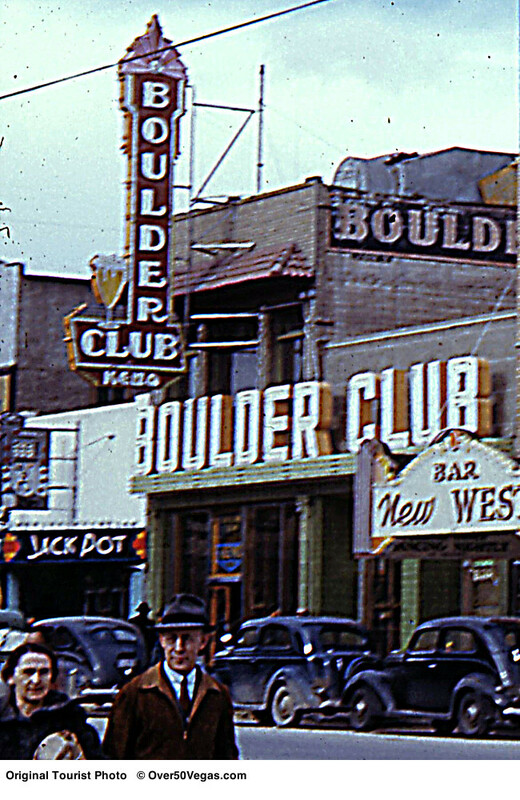 A unique color tourist photo of the Boulder Club with its neon sign. This photo was dated 1941. The Jackpot Club is on the left and the New Western is on the right in the photo. Here is a short excerpt dealing with the Boulder Club. 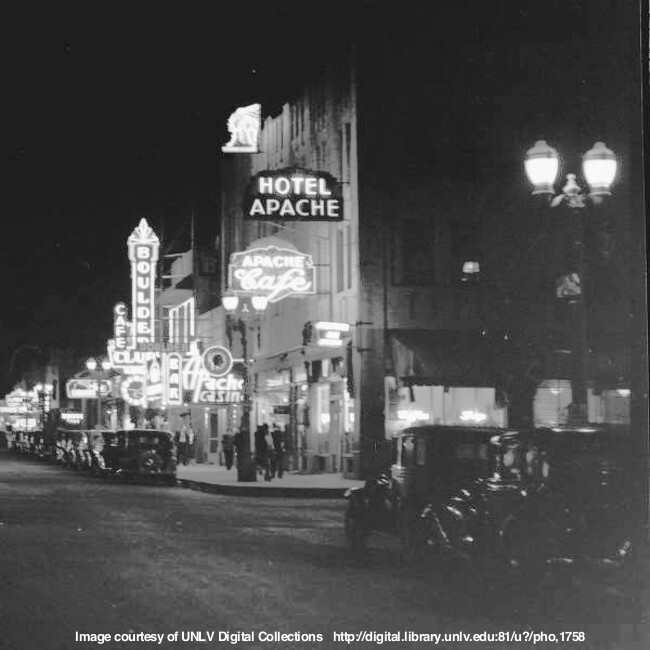 Please visit his site and read the fascinating story of neon in early Las Vegas. Since the new club was in the middle of the business district, Goumond decided he needed a sign that could be seen at the railroad depot, and by drivers traveling on U.S. 91. 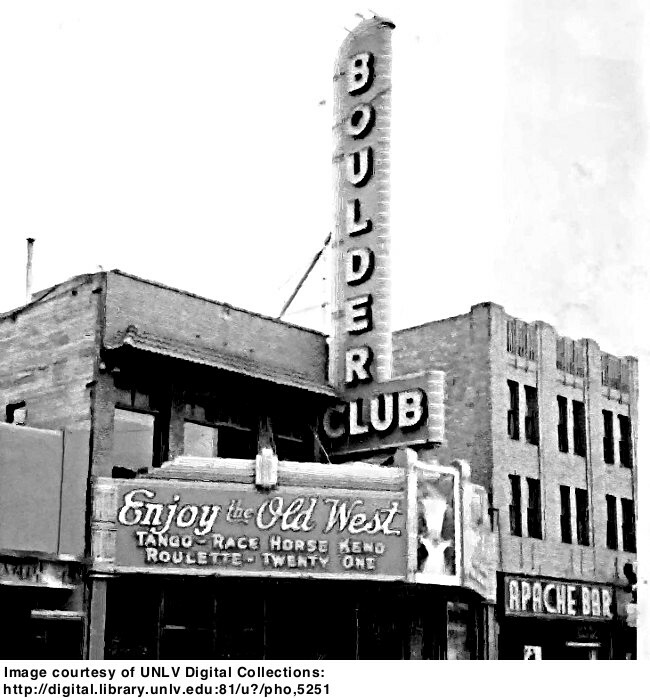 The Boulder Club opened on Saturday night, July 27, 1929, with gaming tables on the west side of the long two-story building; the bar and a few “nickel-in-the-slot-machines” were on the east side. 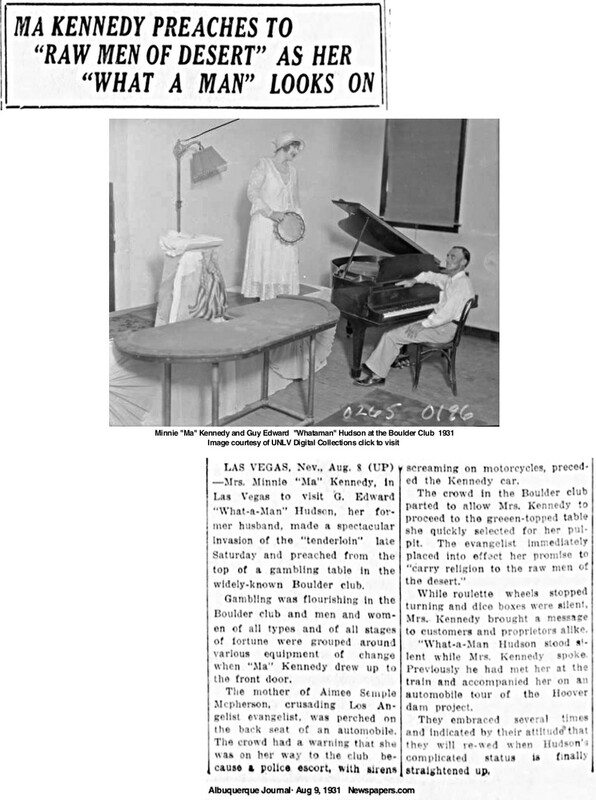 July 27, 1929, Las Vegas Review, page three. July 27, 1929, Las Vegas Age, page one. 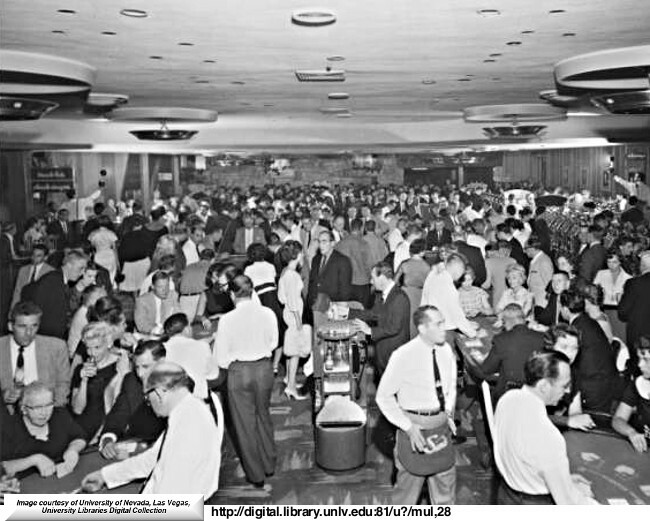 The first full gaming license issued for the Boulder Club was on April 1, 1931, according to Fuller's Index Plus. Listed on the original 1931 gaming license were: P. J. Goumond, Clyde Hatch, J.V. Murphy, and Walter Watson. The license holders would change over the years as interests in the club were bought and sold. 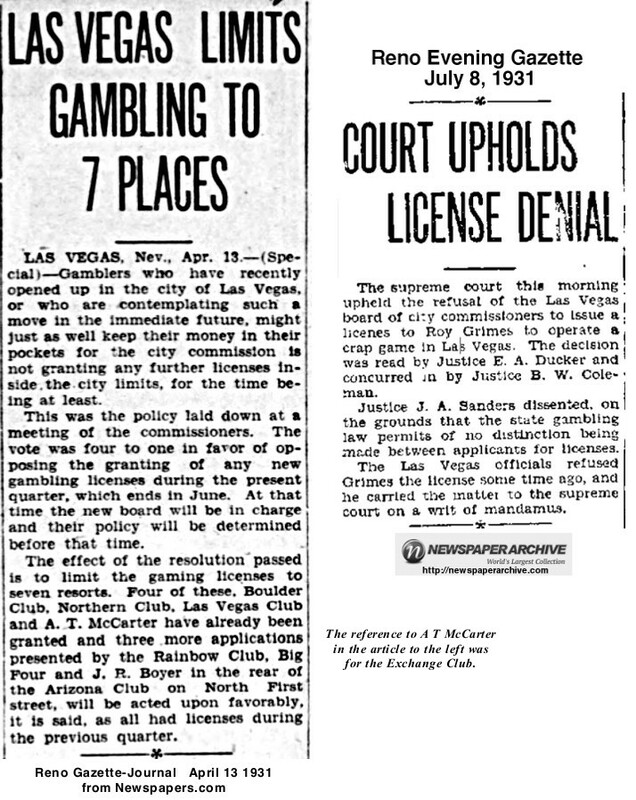 The April 1, 1931 date for the license comes after gambling was legalized statewide in Nevada, but the Boulder Club was open for the gaming business two years prior to that. 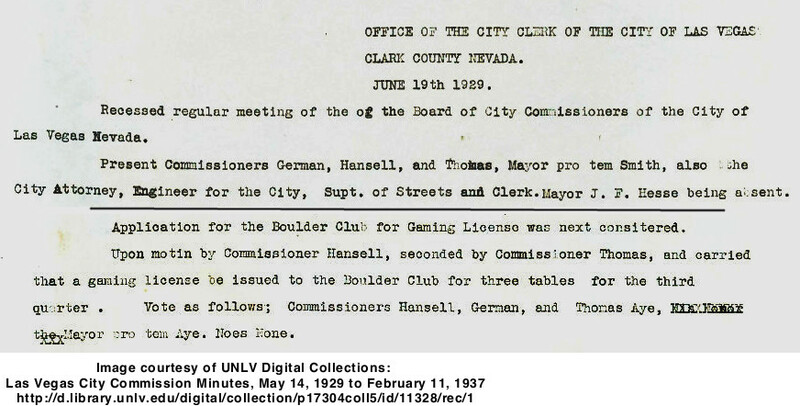 In the minutes shown below for The Board of City Commissioners on June 18, 1929 the Boulder Club was issued a gaming license for 3 tables for the third quarter of 1929. (Note: Gambling was outlawed in Nevada in 1910 and would not be legalized in Nevada until March 19, 1931. However, poker could be played if the house did not take a percentage. 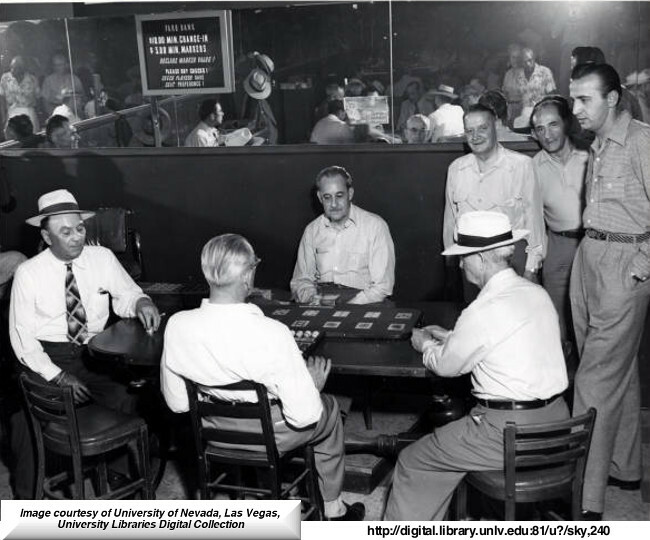 0n March 6, 1933 all Keno games in Las Vegas were closed, following action of the city council in canceling all such permits because of moral reasons. The council denied a license for Keno to the Boulder Club and revoked the licenses at The Rainbow Club and the Vegas Club. “It has been called to the attention of this board, by a committee of the Grand Jury, that the playing of Keno as a licensed game in the city of Las Vegas has a demoralizing effect upon the good morals of the city and further that the game constitutes a lottery, and is an unlawful game"
January 1949 Prosper J. Goumond and Lillian W. Witcher were running the race book at the Boulder Club. The Boulder Club race book had been operated by Connie Hurley up until December 31, 1948, but his permit was revoked by the board. The race book license was then given to James L. Young, Larry Hezzlewood and Marion Woodworth. Photograph to the left of the interior of the Boulder Club in about 1953. Prosper Jacob (P. J.) Goumond, died November 24, 1954. He had been a Nevada resident for more than 50 years and he died at the age of 78. He was survived by his granddaughter Mrs. Michael (Margo Goumond) Hines of Las Vegas. P. J. Goumond left most of his estate, valued at over $876,000 to his granddaughter Margo Goumond Hines. His will was admitted to probate. However a year later the will was contested by Madge Egolf, 42, who contended that she was Goumond's “sweetheart” and he had intended to leave the bulk of his estate to her instead of his granddaughter. Miss Egolf worked for the Boulder Club and Goumond until his death. Goumond had included a codicil in his will that left Madge Egolf the sum of $5,000. At the time of his death Goumond was listed as a 25% owner of the Boulder Club. The case contesting P. J. Goumond's will was finally dismissed on September 11, 1956. He called the language of the complaint "shocking and bold." P. J. Goumond's house was located at 420 S. 7th Street and has been relocated to Heritage Street, a collection of restored historic buildings that depict daily life from different decades in Las Vegas, Boulder City, Henderson and Goldfield at the Clark County Museum. It was moved in 1984 and opened in 1999. When the fire broke out, a safe containing $190,000 in cash was transferred under heavy guard from the Boulder Club to the Horseshoe Club for safekeeping. There was extensive fire, smoke, and water damage. It was the first time the club had been closed since it opened in 1929. 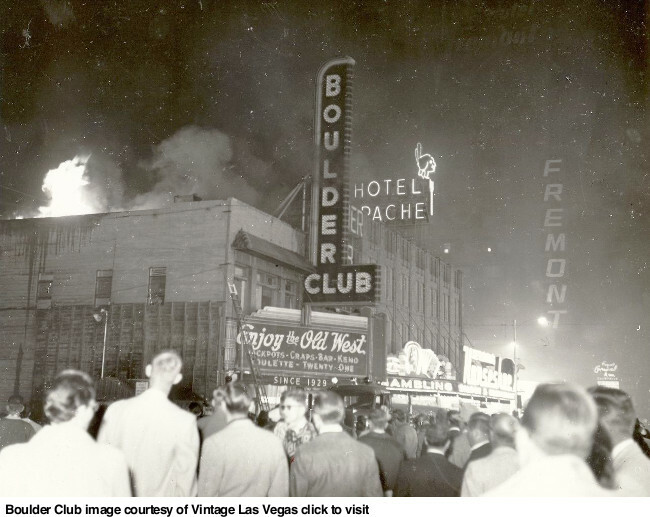 The club was temporarily closed on November 26, 1956 for repairs and an investigation into the source of the fire. Earnest Amante, one of the operators of the Boulder Club, said plans were underway to reopen as soon as possible. were held out as among the possible causes of the fire. Officials had ruled out spontaneous combustion, faulty electrical wiring, or arson at the time. the second floor of the Boulder Club was the site of a devastating fire. The fire broke out on the night of Nov 25, 1956 in the forward part of the building and climbed up to the second story. Thirty firemen fought the blaze from three sides and it took about an hour to get it under control. One person, elderly custodian Eddie Roach, was trapped inside by the fire but was rescued by the fire department. There was some damage reported to the interior of the adjoining Apache Hotel, but the Horseshoe Club next door escaped damage. took to the top of a gaming table in the Boulder Club to preach! Jim Young, and Lillian W. Witcher. When the control board approved the new operators Milton B. “Farmer” Page was also included. The new operating partnership agreed to place a $200,000 bankroll in the establishment. Larry Hezzlewood and Farmer Page were in active charge of the club when it reopened about April 12th 1957. 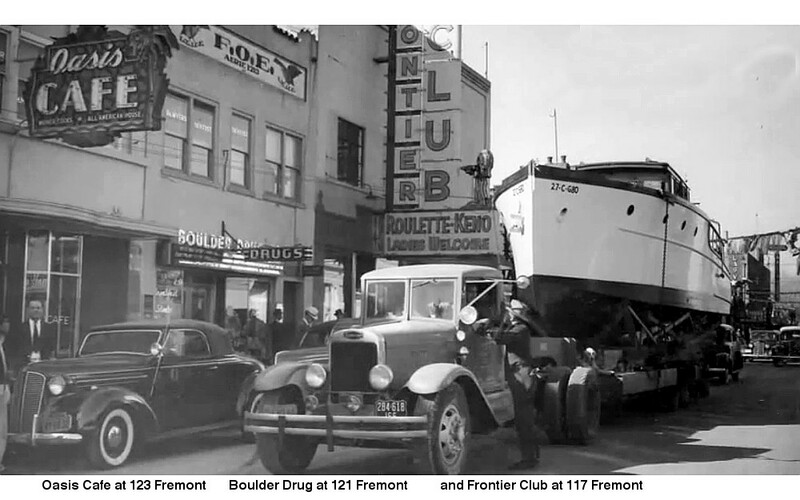 The Boulder Club was operated under a lease to the Amante Brothers and Associates in 1957 when they informed the owners of the club that they could no longer remain in business. The owners then planned to resume management themselves, but would have to go through regular channels to get the necessary permits. A close-up of the new sign shows the owners names prominently displayed. The closure was based upon an earlier agreement by the owners, that upon the death of one of the partners the club would cease operation. Milton “Farmer” Page died on September 12, 1960 and his widow decided against continuing the partnership operation. Ed Levinson, president of the Fremont Hotel and head of a group operating the Horseshoe Club, said the Horseshoe would take over the Boulder Club on January 1, 1961. A wall separating them would be knocked out and the clubs would be operated as one. The operation of the Boulder Club with the original partners did not last much longer. It closed on September 30, 1960 after 31 years of continuous operation.